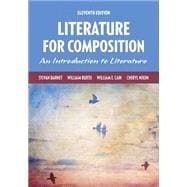 With an emphasis on critical thinking and argument, Literature for Composition offers superior coverage of reading, writing, and arguing about literature along with an anthology organized around eight thought-provoking themes. Throughout, the authors demonstrate that the skills emphasized in their discussions of communication are relevant not only to literature courses, but to all courses in which students analyze texts or write arguments. This title is also available with MyLiteratureLab – an online resource that works with our literature anthologies to provide engaging experiences to instructors and students. Students can access new content that fosters an understanding of literary elements, which provides a foundation for stimulating class discussions. This simple and powerful tool offers state-of-the-art audio and video resources along with practical tools and flexible assessment. How Do We Engage in Critical Thinking? DAGOBERTO GILB • Love in L.A.
JULIA BIRD • 14: a txt msg pom. Is the Author’s Intention a Guide to Meaning? What Characterizes a Sound Interpretation? JOYCE CAROL OATES • Where Are You Going, Where Have You Been? WILLIAM SHAKESPEARE • Sonnet 18:Shall I Compare Thee to a Summer’s Day? What Does Your Own Institution Offer? EMILY DICKINSON • I’m Nobody! Who are you? NICHOLAS CARR • I s Google Making Us Stupid? ANDREW LAM • Who Will Light Incense When Mother’s Gone?